Summer is here and that means barbecues, parties and ball games. So who wants to be slaving over a hot stove while the rest of the world is having fun in the sun? But, alas, your family has to eat. Telling them that salad is on the menu will probably elicit cold stares. The meat-and-potatoes camp will surely mutiny when faced with a pile of rabbit food. That’s why we’re talking about hearty, satisfying (and meaty) meal salads. These make-ahead salads are easy to prepare and will get you out of a steamy kitchen at the hottest time of the day. Even without a recipe, you can create your own meal salad by adding some of the following ingredients to a bed of lettuce and other vegetables. Leftover pasta, rice or couscous can also be the basis of a meal salad. Protein sources like marinated grilled chicken breasts, strips of lean flank steak or low-fat cubed deli ham can really jazz things up. Hard-boiled eggs, cheese and even tofu can add considerable amounts of protein to a main dish salad. Fish and seafood rich in omega-3 fatty acids such as salmon, crabmeat, scallops and fresh grilled tuna will turn a plain salad into a classy dinner that you’ll be proud to serve to guests. Be sure to include lots of colorful vegetables, beans, nuts, seeds and whole grain breads and pastas. Save time and buy your favorite bottled dressing or save money and with just a few ingredients, you can make your own! Buy a big loaf of whole-grain bread and you have a complete and balanced meal on every plate! One of the most popular salads is Chicken Caesar Salad, and it’s also easy and inexpensive to make. Serve this with a big loaf of crusty French bread and a plate of ripe heirloom tomatoes on the side. Short on time? Buy a rotisserie chicken and a good bottle of Caesar dressing, and you’re good to go! Get your omega-3 quota with Grilled Scallops over Mixed Greens and Herb Salad. (FYI: Cooking Scallops video) This recipe is quick to make and will really impress your guests. Substitute cooked shrimp or salmon if you prefer. Pretty on the plate too! Another salad with lots of eye appeal is Salad Nicoise (shown above). You can make a beautiful arrangement of vegetables, tuna, olives and hard-boiled eggs and take a picture before you eat it. And with only five ingredients, you can afford to make your own Vinaigrette Salad Dressing. Make your own Taco Salad -pictured above! There are tons of twists on this salad, including this one that can be set up buffet style. Invite the neighbors over and let the kids help themselves! Just about everything, including the ground beef, can be chopped, sliced or made ahead and assembled just before dinner. Serve with a big bowl of chips and a side of salsa. This Grilled Steak Salad is so quick and easy, your guests will think you’ve been busy all day! You can grill the meat in advance on a grill pan and let it chill until ready to serve or arrange it when it’s done marinating. The meat is so tender and tasty, you’ll forget it’s a salad! Just because you’re a vegetarian doesn’t mean you can’t sit with the meat lovers! This Tofu Salad from Pioneer Woman has plenty of taste and pizzaz. Potato salad does not have to be weighted down with a mayonnaise dressing. This red bliss potato salad with lemon vinaigrette dressing is perfect for any indoor or outdoor party. Serve this Chicken Salad with Grapes on a bed of leafy greens, bring along a basket of pita pockets and you have an instant picnic lunch. Too hot in the kitchen? Buy a rotisserie chicken or thaw a bag of frozen chicken breast strips. Don’t like grapes and walnuts? Substitute craisins and chopped pecans. Experiment and make it your own! A picture perfect edible landscape, this gorgeous Cobb Salad, with its colorful rows of vegetables, meats and hard-boiled eggs looks too good to eat! Low carb and easy, too! 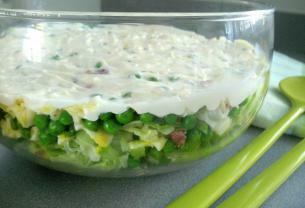 Layered Salads are impressive and delicious. Plus, this one can be made the day before serving it. What a great array of summer salads, perfect for these hot summers days. I love the videos they really help and that Red Bliss Potato Salad really caught my eye and is on my list for my next BBQ. I always make my summer salads in the morning before work. After a long day it’s great to have a healthy dinner all prepared! Wonderful article. I’m not a big salad person but I read your recipe for the Red Bliss Potato salad sounds delicious and one that I will be trying. Check out this salad too if you like potato salads! Well, I am going nowhere if I have no salad to eat in summer! I really love the ones you teach us to make above!! !